Perfect for small group outings, this seasonal cruise offers panoramic views of the New York City skyline aboard a Hornblower yacht. Dine on a decadent lunch buffet and give your holiday music requests to the DJ! Kick off the holidays on the water. Once boarded you’ll be shown to your seats. You’ll be able to purchase drinks throughout the cruise. 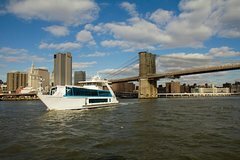 You’ll start cruising at 12:00 pm to enjoy all the Hudson River, New York Harbor and East River have to offer. Shortly after the cruise begins, the buffet will be open for you to enjoy a delicious Festive inspired lunch buffet. Watch it all pass by again on the way back while enjoying drinks, coffee, tea and dancing to the onboard DJ. The cruise ends back at Pier 40 at 2:30pm.